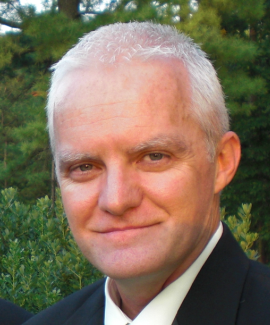 Randy Lindsey, the infamous Volume trading expert announces . . .
"The New Hawkeye Volume Starter Package"
I’ve got some GREAT news! We’ve just put together a SPECIAL NEW PACKAGE that is exactly what you need to get started using volume, that I can assure you gives you the edge with your trading. Listen, the truth is . . . we have a number of people on our list, who for one reason or another, just haven’t made the decision to purchase our software yet. Sure, they know the predictive power of using volume in trading. AND, they enjoy following along and seeing the FANTASTIC RESULTS we get using our indicators. But for one reason or another, they just haven’t made the decision to begin using these indicators to start making money for themselves. For some, it has just been a matter of timing not being right. For others, they haven’t had the money to spend on a full suite of tools. Well, I’m pleased to announce that we’ve put together a special . . .
. . . including 5 of my top indicators, access to our training room, and a free copy of my Volume Secret Book. And, the best part is that the price is SO LOW, virtually ANYONE can afford it. So, HERE are the details . . .
As you may know, Volume is the cornerstone of the Hawkeye suite of tools, because it provides the key advantage that professionals have in knowing when the market is being accumulated, distributed, or if there is no demand at all. Volume is the ONLY LEADING INDICATOR which signals a price move PRIOR to it happening. If you haven’t been successful yet, it’s likely because you’re using old, outdated indicators. You need access to these unlagged volume indicators the professional use. And if you’re already a successful trader, this will make a TREMENDOUS difference in your profitability, because it will probably filter out many of the minus (or losing) trades that you’re having. The Volume Indicator contains a complex algorithm which executes over 300 calculations per bar in order to analyze the price action and associated volume. So, it gives me and other Hawkeye traders a TREMENDOUS advantage when we trade. Hawkeye Volume works in ALL MARKETS and can be used in ALL TIMEFRAMES for both tick and time charts – from longer term swing and trend trading on daily/weekly charts, down to fast scalping on an intraday basis. And it also works on Forex, where we take tick data and apply the Hawkeye Volume Algorithm. 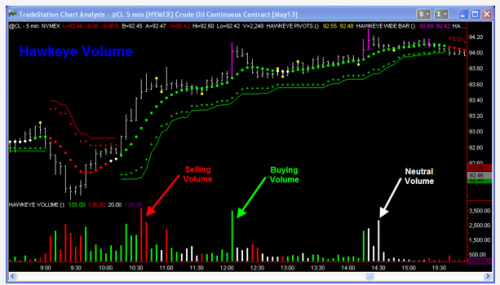 Ultimately, Hawkeye Volume shows us whether buying or selling volume is dominating the market. In other words, it just doesn’t TELL you the volume, as with other trading software, but it actually tells you whether the volume is professional BUYING or professional SELLING. And this is displayed in a simple and visual way: red shows professional selling, green shows professional buying, and white shows no demand. The end result is likely one of the most accurate volume predicting indicators available to traders today. Now, let’s talk about the second indicator you’ll receive . 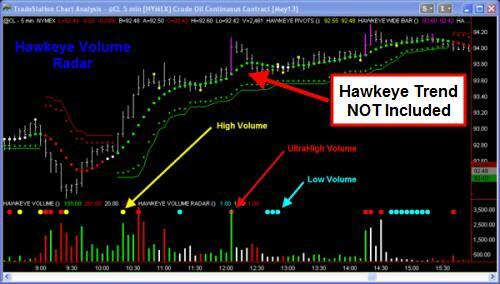 . .
Just like our Volume Indicator, Hawkeye Volume PaintBar allows you to simply look at the price bar to determine if that bar has a volume BUYING bias, a volume SELLING bias or a volume NEUTRAL bias. But, the key difference is it displays itself on the price bar. A green bar means markets are rising — a strong signal of a continuation of the trend. A red bar means markets are falling, confirming the downwards trend. And a white bar is an early warning of potential change in direction as the volume changes from buying to selling or from selling to buying. The real value of both the Hawkeye Volume and Volume PaintBar indicators, is their ability to help you to manage your emotions, keep you in trades longer, and build more profitable positions. So, I’m sure you’re going to love them. Next, let’s talk about . . .
As you know, occasionally, the market has SIGNIFICANT high or low volume periods. With this tool, the unusual changes in volume are highlighted, because they are often a precursor to a shift in market sentiment and direction. And by using Volume Radar, you’ll have an early warning signal of these changes. When Volume Radar finds any significant extremes, it places one of three dots on the screen. Volume Radar is EXTREMELY reliable in long-term timeframes on daily, weekly and monthly charts, and it’s a must-have tool for traders who prefer to trade in those timeframes. Now, besides Hawkeye Volume, Volume Paintbar, and Volume Radar, you’ll ALSO receive . . . This indicator signals temporary changes in the direction of the price, such as a pullback or even a complete reversal. And Hawkeye Pivots displays these points as a yellow dot, which gives you GREAT visibility into key areas of price support, resistance, and consolidation. Now, the LAST of the five indicators is the Hawkeye Widebar. As you may know, sometimes the market moves very quickly in one direction. 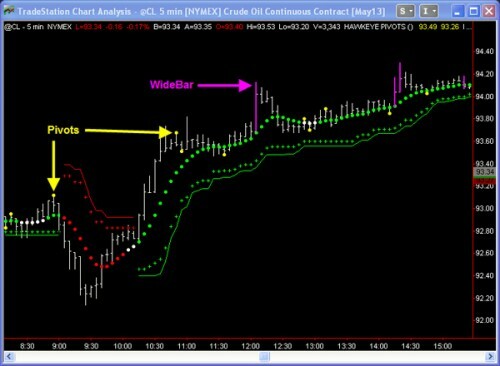 When this happens, the bars that are created on the charts are called “wide bars,” and appear as a bar with a wide price spread on the timeframe you are trading, and is painted in a magenta color on the chart. Hawkeye WideBar tells you when the market price exceeds a certain range over a 20 bar period. Most traders jump into the market upon seeing a wide bar, thinking that it’s a breakout and they are frightened that they are going to miss out on a great trading opportunity. But many times, the market pulls back, stopping out those traders who got into the market too soon. Since Hawkeye WideBar indicates extreme price volatility in the market, it’s a clear signal to us to sit on the sidelines and stay away from the market until we see either a close outside the range of the wide bar or consolidation, followed by a new trend. And the good news is that ALL of these are currently available for Tradestation, NinjaTrader, MetaTrader 4, and TradingView. Now, in addition to these five indicators, you also get access to our . . .
And you will ALSO get a copy of my book . . .
Let me ask you a question . . . If you had a way to see just a FEW days into the future, how much money would you grab? A few hundred dollars? A few thousand? . . . or MORE? In other words, WHAT IF you could look at ANY chart and know IN ADVANCE when it was ready to take off? 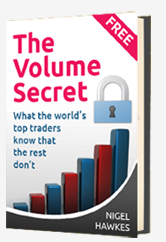 In my book, The Volume Secret, it shows you EXACTLY how to use volume to make SUBSTANTIAL profits, no matter what market you’re trading, whether it’s stocks, bonds, options, commodities, or Forex. This method isn’t like anything else you might have heard about. But it IS being used by some of the world’s most successful traders and fund managers. And the good news is you get a copy of my book when you purchase the “Hawkeye Volume Starter Package” today. So now, the only question is . . .
Well, THAT’S the best part! The price for the “Hawkeye Starter Package” . . . including the Volume Indicator . . . Weekly access to the Training Room . . . . AND a copy of my Volume Secret book is just . . . $97! And I’m NOT saying $97 per month! It’s just a ONE-TIME charge of $97! That’s a savings of over $1,000! That’s just the cost of a night out at a fine restaurant with a bottle of red wine! And this is quite a deal, because most of our Hawkeye packages go for $2,000 . . . $2,500 . . . or even $3,200! But all of that changes TODAY, because you can get the entire “Hawkeye Volume Starter Package” for just $97! And, you’ll be ready to go. You’ll be IN THE GAME, using Volume-Based Trading. And listen . . . at this price . . . EVERYBODY can afford this . . . without any excuse. The truth is . . . VOLUME is without doubt, the most POWERFUL indicator there is to use in your trading. It gives you the edge. So, I can honestly say that . . .
I’ll even go as far as saying, if you don’t grab a copy of this RIGHT NOW, I’m concerned that you may not be very serious about trading. This is the lowest price I’ve EVER offered a Hawkeye package for. And it has EVERYTHING you need to get started. And on a personal note, I really WANT you to join the Hawkeye family of traders, because understanding volume and using it in my own trading made all the difference for me. Also, over the years, I’ve really enjoyed helping thousands of traders, just like you, to improve their trading results by using volume. So, all you need to do is to click on the button below, and get started right now. If you aren’t using volume in your trading yet . . . Seriously, go ahead, click the button right now, and let’s get started. Thanks for your time, and I look forward seeing you in the training room.